One of the most interesting places I have traveled to has a unique expression of religious devotion. Each major village is fiercely loyal to its tribe and constructs elaborate temples for worship. There are three kinds of participants in the worship service. The performers dress up in colorful costumes and engage in highly choreographed dances around the central altar of the temple, exhibiting great skill in their flexibility, endurance, and artistry. Secondly, there are the natives who make a sacrificial offering every time they come to the temple. 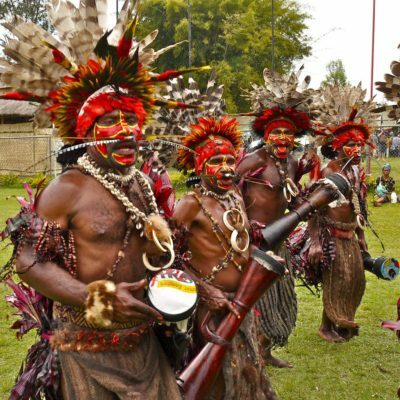 They participate by rhythmically chanting and singing special tribal songs to encourage their favorite performers and to demoralize rivals. They know every detail of the most skilled performers’ lives and carry pictures of these performers around with them on pieces of palm leaves. Some even go so far as to dress up in colorful costumes just like their favorite performers, even though they lack their skills or fame. There are special burnt offerings, libations, and worship attire made available at the ceremony, usually at highly inflated prices. Then there are the priests. They are experts in the law, a highly complex set of guidelines for how the worship service is supposed to be conducted. They have special stations around the altar where they are called upon to judge the performances and point out violations of the law to the performers. Ha, ha! Not the kind of worship service you were expecting, was it? For many people today, the strange idea of a “high priest” is something you might only see in an Indiana Jones movie or when studying the history of primitive cultures. It’s not part of our everyday experience so we’re unfamiliar with why it’s important. As we return to our expository preaching series through the book of Hebrews, verse 4:14-5:10 introduce us to a major section of the book on Jesus our High Priest. We’re told to confidently “come near” our Great High Priest Jesus for help when we need it!